Going camping with kids is a classic childhood activity. We had taken my older two camping, but my younger daughter had never been so it has been on our family to do list for a while. When KOA asked if we wanted to try out one of their Kampgrounds this summer we jumped at the chance. 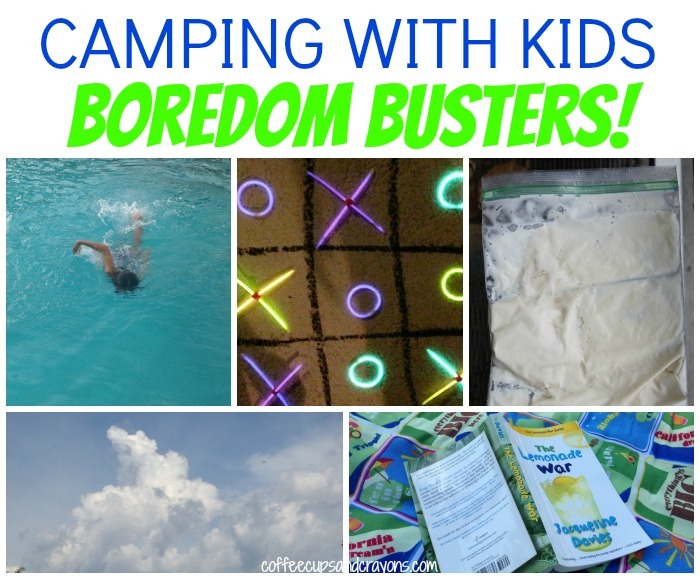 It was a ton of fun discovering “What is behind the yellow sign” and we came up with a list of must-do camping activities for kids! 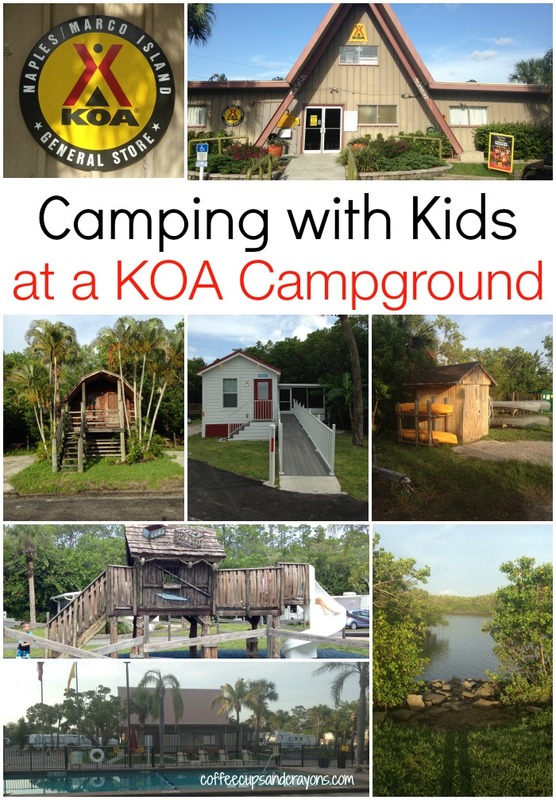 We stayed at the Naples/Marco Island KOA campground in FL which is considered a KOA Holiday campground. They say Holiday campgrounds make great base camps for discovering a new area and I would have to agree—it was the perfect spot to experience all of the fun of camping while also exploring the beaches of Marco Island. We booked our stay without knowing a lot about the area and loved that we didn’t have to spend a ton of time researching activities. 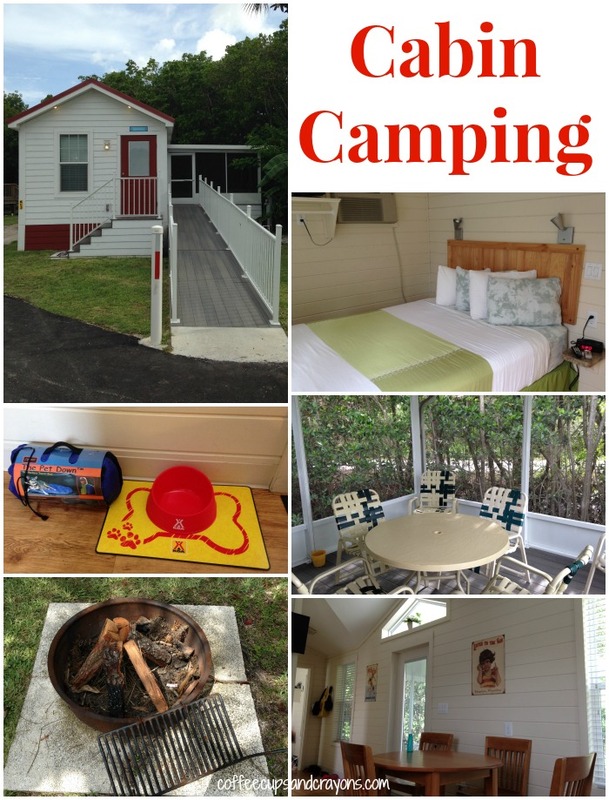 At the Naples/Marco Island KOA you can swim in the large pool, go in the hot tub, go fishing, walk on the nature paths, rent a canoe, play on the Fishing Shack themed playground and rent bicycles without having to leave the campground. There are even manatees in Henderson Creek that campers have seen while canoeing and kayaking! In addition to the activities on site the owners also highly recommended checking out the local beaches and explained that the area is known for their shelling and white sand beaches. Yay! There are also airboat tours of the Everglades nearby that we hope to check out on our next visit. There were so many fun activities to do at the campground, but getting to sleep in the cabin and cook over the campfire was by far my kids’ favorite! We stayed in a Deluxe Cabin that has 2 bedrooms, a bathroom with a shower, air conditioning and even a flat screen TV. There is also a small kitchen area, free wifi, a large screened-in porch, a gas grill and huge fire pit stocked with firewood. It is a non-camper’s dream! For those that are more into “roughing it” than we are, they also have tent sites, RV sites and one room camping cabins (without a bathroom). With so many things to do at a KOA campground and even more in the surrounding towns there aren’t a lot of activities you have to plan for your kids, but there are some we think you just must do. 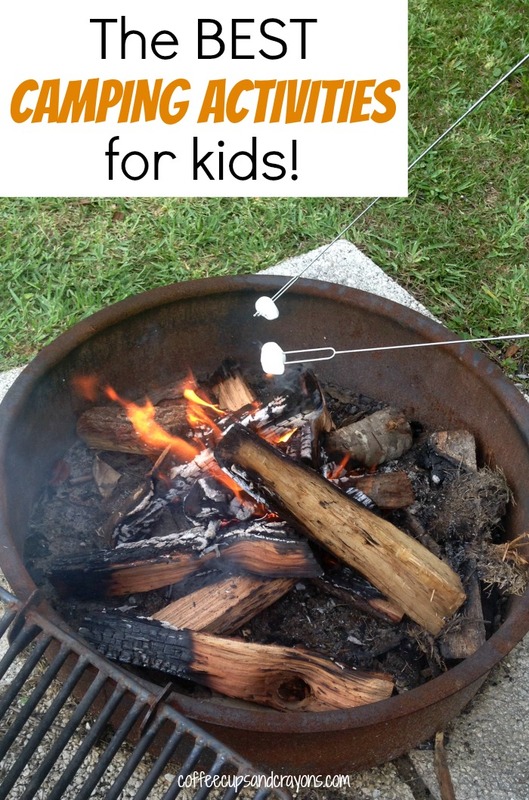 These are the best camping activities for kids that make a family camping trip complete! Tell stories by the fire. Make leaf prints and rock pets. Catch fireflies or other bugs. Play glow in the dark tic tac toe. Find a walking stick and go on a hike. Make ice cream in a bag. One of the things we enjoyed most about our family camping trip was the chance to just hang out and be together. We took advantage of our screened in porch and spent time outside drawing, reading and watching the animals and bugs all around us. If you follow me on Instagram you know that we met up with a family of racoons and got to see a live sand dollar on the beach. To read other families’ camping experiences visit the KOA Family Camping round up page on Trekaroo! Disclosure: I have received a complimentary stay at KOA via Kampgrounds of America, but all opinions stated are my own. This is a sponsored post for Mom It Forward. My favorite activities as a kid were definitely campfire stories while star gazing. Yes! The simple ones are always the best! What a great list! I am going to bring a copy of it when we go ‘cabin camping” in August! Thanks! Yay! Have so much fun!!! 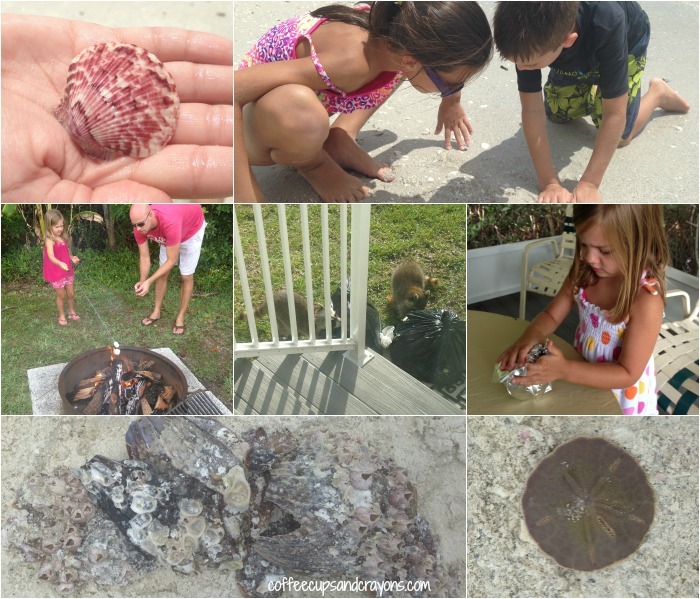 My daughter and I enjoy collecting rocks and shells. Bet they had a nice assortment of them! Tons! It’s such a great activity! Great ideas! Wildlife bingo is always a winner with our kids. It can be played all weekend. That is a fun idea!!! It is so important to unplug and get your kids into the real world! Heather! I LOVE that idea!!!! I’m totally doing it next time! Thanks for all the fun camping ideas! That KOA campground looks like so much fun too! So true Shannon! The stars are amazing at a campground!!!! I love KOA’s activities and accommondations too! I have never KOA’ed but I’d LOVE to try!! You should check one out! They makes camping sooooooo easy and fun!!!! I love the glow in the dark tic tac toe the best!! Such a great idea!! One of our favorites is to pack a small bag of googly eyes and some glue- we make all kinds of “creatures” using rocks, leaves, pine cones, sea shells, bark, you name it! My kids would love to participate in this! Camping with air conditioning??? I’m there! Such great ammenities! YES! It is awesome for anyone (like me!) who isn’t into roughing it! We are planning our first ever camping trip as a family and this list of activities is perfect! One thing I do not want to hear is I am bored so having your games ready and available will help! Yay! You are going to have a great time! Just don’t forget the bug spray! I passed on a love of camping to my kids and now to my grandkids. Everyone says its cheating but staying in a cabin is 99% better then tent camping. The cabins come with linen,furnished kitchen and bathroom and shower. Its stress free and if you add up everything you dont have to bring or buy a cabin is propably cheaper. I totally agree! all the fun of camping and a good night’s sleep! These are such great ideas for activities for the kids & I will be printing all of them to remember for our next trip or even jsut summer days at home! This looks like a fun KOA location, thanks for sharing! Thanks DanielleD! I’m glad you like them! And the location was amazing–I highly recommend it if you love the beach! How fun! My 2 and 5 year old would really enjoy painting rocks they found camping. Thanks for the ideas!! Yes! And if you don’t want to pack paint just throw in some sharpies! We love exploring new hiking trails and seeing wildlife. It helps my kids appreciate nature. Lots of great activity ideas for kids! My daughter enjoys building fairy houses out of natural found materials. These are some great ideas! 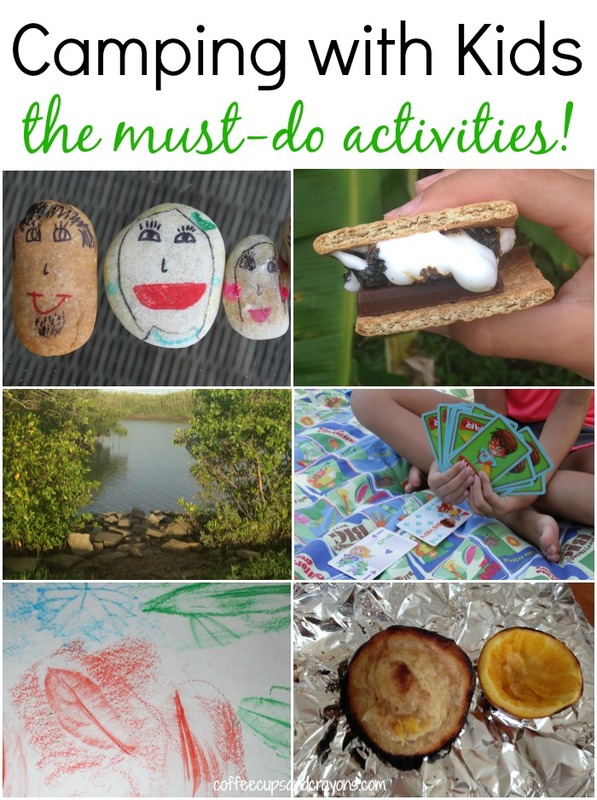 Hope to do some of these activities with our littles on our next camping trip! These are some really great ideas! I would love to go camping with my family! Camping isn’t camping without s’mores! Thanks for the great list of activities. camping with kids is the only way to camp, it makes the experience better!